This is a rough draft in progress. Some of the information here may be incomplete, inaccurate, or badly worded. The name “Jape” is an acronym: “Just Another Proof Editor,” although that's not mentioned in the more recent documentation (perhaps because proof “calculator” sounds a bit different from a proof “editor”). The prime purpose of this article is so I can keep track of what I'm learning. I find it useful to take notes when trying to learn something even if the existing tutorials are comprehensive. I'll tidy these notes up as I work through the material. I'm not intending to overlap with existing tutorials. The main page for Jape is run by Richard Bornat at jape.org.uk. He also mentions Jape with some links on his Middlesex University Web page. This and other manuals are available from jape.org.uk. Jape in its natural deduction mode can perform proofs and disproofs. The information presented here (so far) is restricted to the proofs. E and ¬E to produce E∧¬E. Here we see two screenshots of menu choices. Going forward from one part of the proof to a later part of the proof. Under each menu item two horizontal lines group together the first eight choices—considered generally useful—from the later options—which should be used with more caution. Making another point, Bornat suggests trying backward steps first, despite the novice's tendency to both read and do proofs forward. All preferred backward steps are intro steps except for the last: truth. 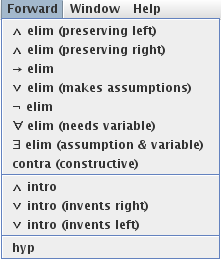 All preferred forward steps are elim steps except for the last: constructive contradiction (called contra (constructive) in the menu). In the table below I use the shorthand “we” to refer to the user and the software together, as the software automatically does many of the actions described for each step. ∧ ∧ intro: We move backwards from A∧B to A and B. We introduce ∧ to justify A∧B. ∧ elim: We eliminate ∧ from A∧B to justify A or B (you choose). → → intro: We move backwards from A→B to an assumption box with assumption A and conclusion B. We introduce → to justify A→B. 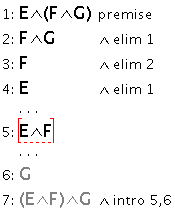 → elim: If we have A then we eliminate → from A→B to justify B. 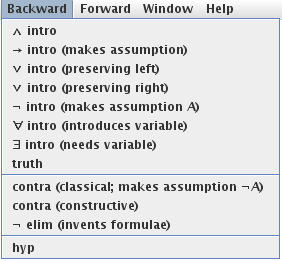 ¬ ¬ intro: We move backwards from ¬A to an assumption box with assumption A and conclusion ⊥ (contradiction). We introduce ¬ to justify ¬A. 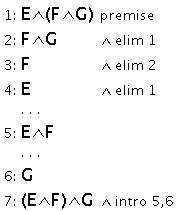 ¬ elim: We eliminate ¬ from ¬A in order to add A to a later line. (You can insert A into an assumption box by clicking on the box's conclusion.) This step may or may not justify any line right away. ∀ ∀ intro: We move backwards from ∀x.P(x) to an assumption box with assumption actual i and conclusion P(i). We introduce ∀ to justify ∀x.P(x). ∀ elim: We eliminate ∀ from ∀x.P(x) to justify P(i) in an assumption box. That box requires actual i as an assumption. ∃ ∃ intro: We move backwards from ∃(x).P(x) to actual i and P(i). We introduce ∃ to justify ∃x.P(x). (To use an inner assumption box click on the conclusion.) ∃ elim: We eliminate ∃ from ∃x.P(x) to put assumptions P(i) and actual i into an assumption box. We conclude C in that box, hence we jump out of the box and conclude C from ∃x.P(x). ∀ and ∃ As the full menu names suggest, the ∀ and ∃ rules require the assumption actual i. 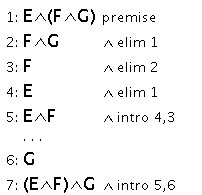 The backwards ∀ intro step and the forwards ∃ elim introduce actual i. The other two steps in this category need actual i but cannot add this line. constructive contradiction backwards direction not preferred… see below… Moving forward from a contradiction ⊥ a selected conclusion is justified. ∧ intro backwards direction is preferred… see above… Moving forward from A and B we can justify A∧B. ∨ intro backwards direction is preferred… see above… Moving forward from A one can justify A∨_B1 or _B1∨A (your choice), where _B1 is a new variable. hypothesis Convert a variable into a subformula by choosing both. Convert a variable into a subformula by choosing both. Although constructive construction is preferred, classical contradiction is possible within Jape. Classical contradiction sometimes works where constructive construction fails. As a result, sometimes a claim may be both proved and disproved. Some steps may justify some lines, create others without justification, and create still others with justification. For instance, we can move backwards from F∧G to create two new lines F and G through ∧ elim. Those two new lines still need to be justified, while the old line F∧G is now justified. In the end, all lines must be justified. Because later lines cannot be used to justify earlier lines, generally backward steps justify the “starting” line, and forward steps justify later lines. Another way to look at the backwards steps is to think of two separate actions: 1) moving backwards from your original “starting” statement to an earlier statement or statements, and 2) moving forwards from those earlier statements to justify the original statement. Working forwards (to later lines) eliminates connectives. This is judged by the direction you're working in: from your existing lines (or reasons) to new lines (or reasons). Most forward steps are elim steps: they eliminate connectives. The distinction can be a bit confusing. In A$$\vdash$$A∨B the first A is left of the turnstile and does not have to be proved. It is a premise. To the right of the turnstile is the conclusion A∨B, which does have to be proved. A premise never has to be proved. It can be used to prove other statements. By contrast, an assumption is temporarily introduced to prove later steps. If an assumption is not proved at some point then it must be discharged later. For instance, if A→B is an unproved statement we can create an assumption box with A as the assumption and B as the conclusion. A→B thus discharges the assumption A in the assumption box. A regular mouse click should select an entire formula and place it in a red-coloured outline. Alt/option plus mouse click highlights a part of the formula—a subformula—and highlights it with yellow. You must choose a target conclusion when using forward ∨ elim and forward ∃ elim. You may choose a target conclusion when using backward ∃ intro, forward ∧ elim, forward ∨ elim, forward → elim, and forward ¬ elim (for example). In an unfinished proof a hypothesis appears before a line of dots, and a conclusion appears after. Therefore a line somewhere between two sets of dots might function as an hypothesis or an unproved conclusion. Choosing the wrong role for that line could prevent you from using a rule that you should be able to use. What?! 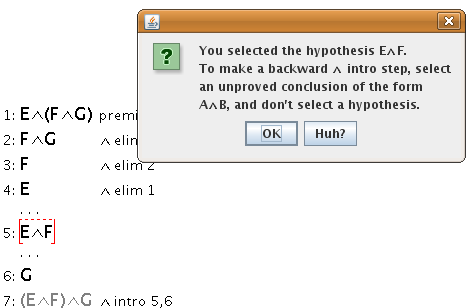 It's clearly an unproved conclusion, so why is Jape telling me not to click on an hypothesis? Obviously clicking on the bottom half of a line with ambiguous function ensures it's considered to be an hypothesis. 1. Richard Bornat, “Roll your own Jape logic: Encoding logics for the Jape proof calculator.” 2005 (PDF), “Preface,” p. 3. Some Jape actions create no new justifications.